Other than Opie’s daily (bi-daily?) swim in the Colorado River in Grand Junction during the 100 degree days, we avoided being outdoors in that awful heat. Unfortunately we couldn’t enjoy the cool mornings or evenings either because the mosquitoes came out in force!! The first night we were there, I (no joke) got over a dozen bites in the 5 minutes I was outside in the evening so yeah, no relaxing outside for me. Since Opie can’t handle the heat and sun while hiking, and I didn’t want to fight the mosquitoes, this was a indoor-air-conditioned-relaxing-video-gaming sort of week. We’re home-bodies so we often enjoy staying home, doing our own thing, reading, and just relaxing. Plus since our next stop was Breckenridge where the weather was cooler (9,000+ foot elevation) with lots of hiking opportunities, we were ok with doing nothing in Grand Junction. A full-time RV friend of ours once described his life as Jello travels, there’s always a little wiggle room in his plans. I like that term to describe what we do. In general, we have mostly firm plans but sometimes there’s a little wiggle to deal with life. Well, our plans wiggled while in Grand Junction. 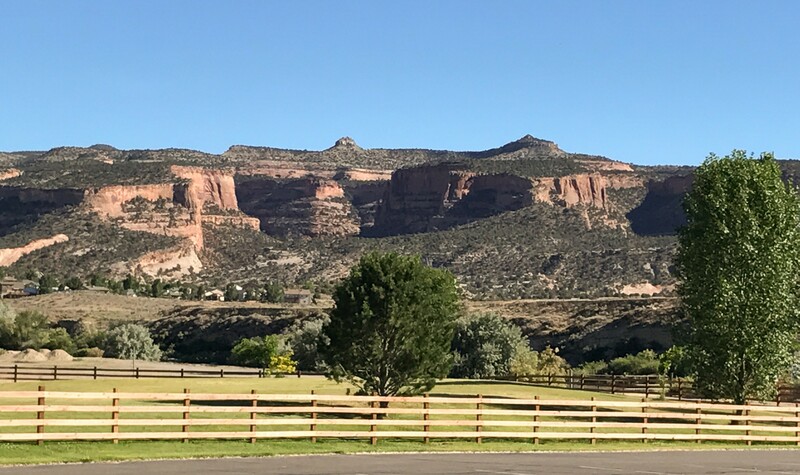 Our inverter circuit breaker was acting a bit flaky for the last couple of weeks but while in Grand Junction, the inverter completely died. Unfortunately we were planning to dry camp in a national forest near Breckenridge next which meant an inverter was a necessity. Since the inverter was still under warranty, we called Magnum and they offered to send us a new inverter and we could send back the broken one. Of course that meant we had to be in a location that could accept packages for us, plus we had to find a campground that provided electricity. We have an extremely accommodating friend in Denver who was happy to receive deliveries for us so Mike spent a few hours furiously searching for places to stay near Denver on short notice. 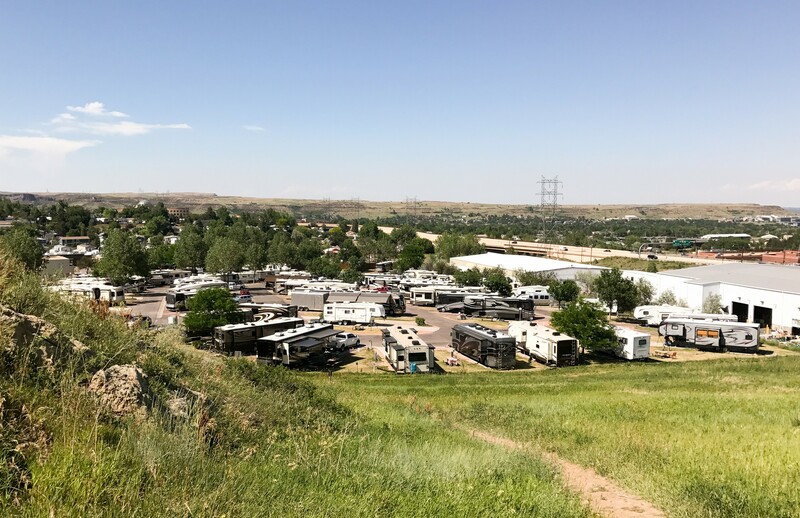 July 4th weekend was coming up which made things tough, but he found one RV park in Golden CO with a site available for 2 nights, and another not far away with a site for 3 nights. So no Breckenridge for us this time around, but that just means something else to look forward to in the future, right? We re-routed to Golden and successfully installed the inverter. Since we were already on a roll with Rover, we used that time to replace his failing front window shade motors and finish up our monthly maintenance list to keep Rover running smooth and happy. With everything lubricated, cleaned, and fresh, we decided to reward ourselves with a jaunt to Denver Comic Con with our friends. 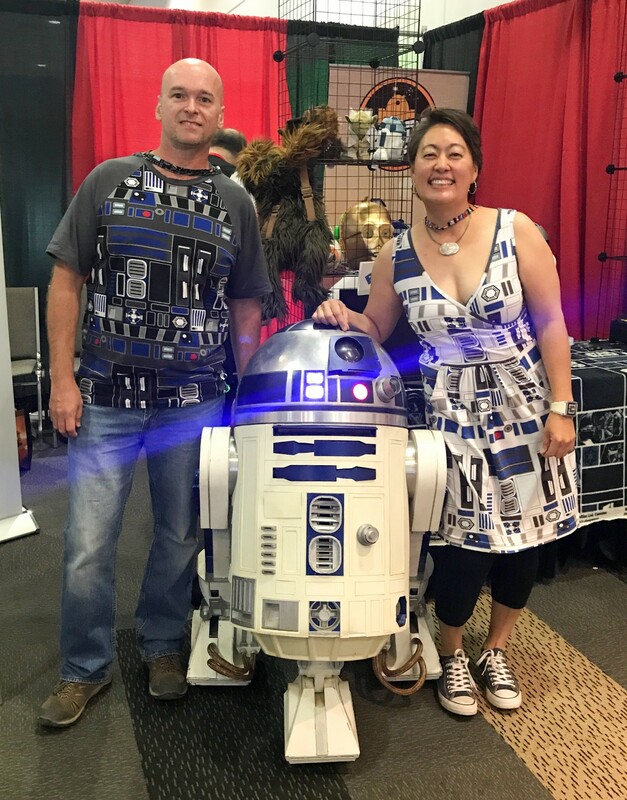 Mike and I dressed up in matching R2D2 outfits (in every other circumstance, we try extra hard to never ever wear the same clothes, or even the same color clothes simultaneously) and enjoyed a day at the Con. We enjoyed walking around, gawking at the costumes, and seeing what the vendors were selling. 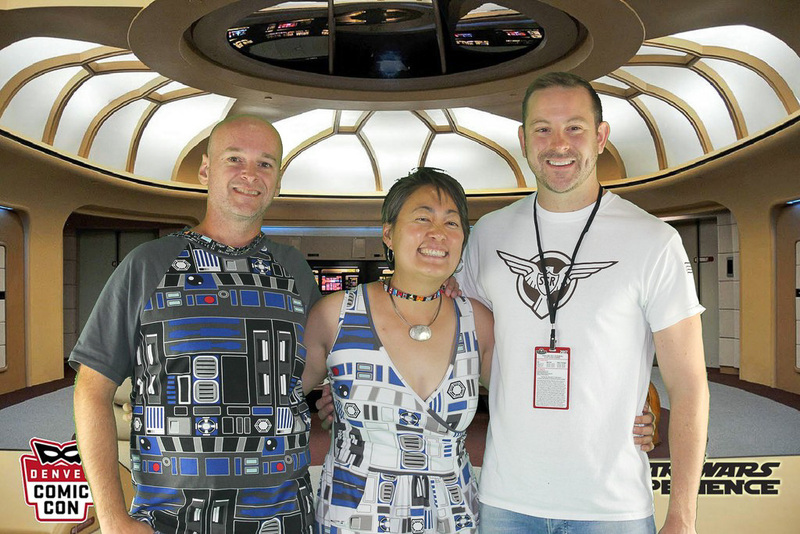 Denver Comic Con whet our appetites for the upcoming DragonCon in Atlanta. Yes, we’re going and yes, we are excited!! 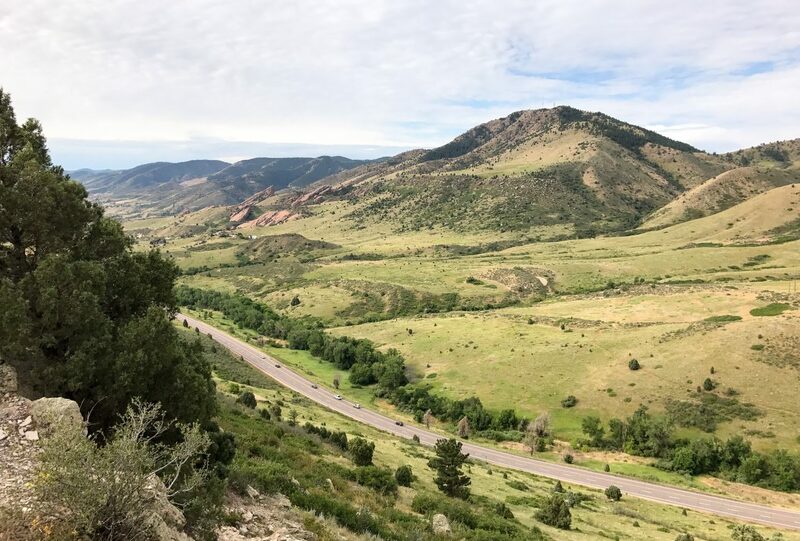 After our successful maintenance/repair stay in Golden, we made it back onto our firm schedule and drove north of Denver to St. Vrain State Park in Longmont CO. It’s a nice state park near Boulder and makes a good anchor spot for day trips into Boulder. 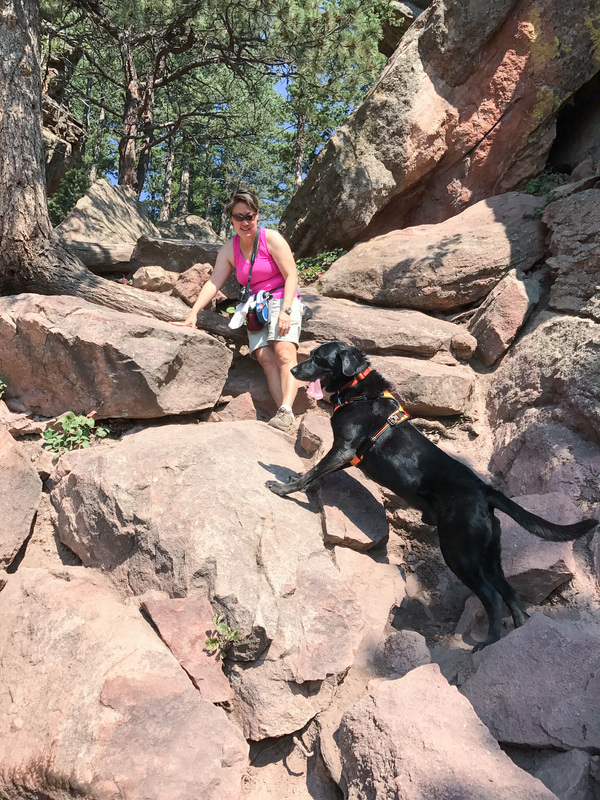 Since Opie hadn’t been hiking for a few weeks due to hot weather, then maintenance work, we thought we’d reward him with a nice hike. 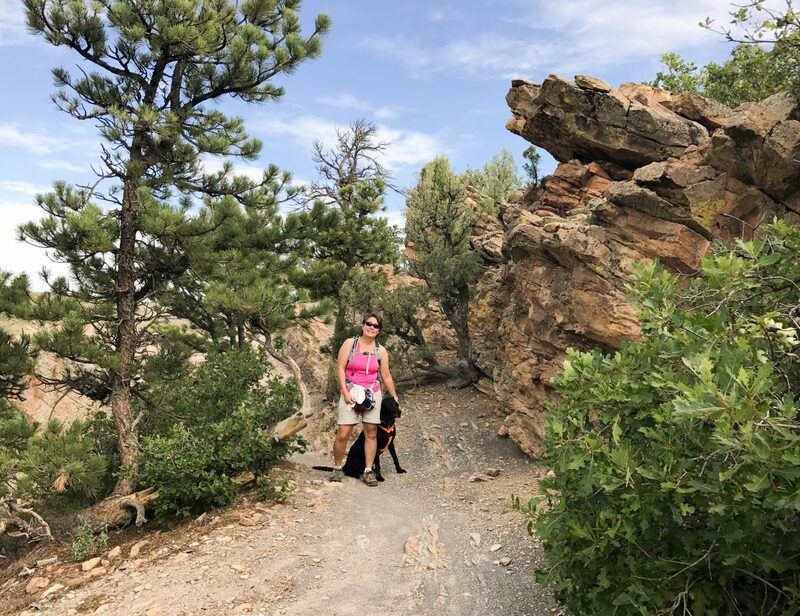 I found the Royal Arch Trail, a popular 3.5 mile out and back hike in Boulder that has a natural arch at the end of the trail. It was rated difficult but we’ve managed difficult in the past and 3.5 miles isn’t that long so that sounded like a good hike for us. As normal, we made it to the trailhead before 8am on a weekday expecting a nice quiet trail. I could not have been more wrong! The parking lot was already full with many hikers on the trail already. Fortunately the trailhead is the beginning for multiple trails so while the Royal Arch trail was busy, it wasn’t overcrowded. 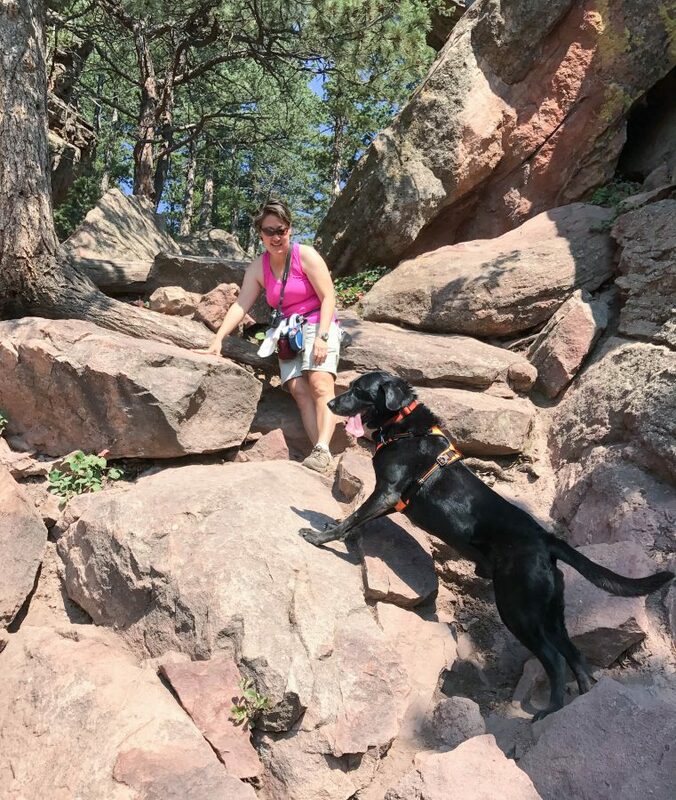 The first half started out in shady areas with some great views of the Flatirons in Boulder and started a steady climb up through the forest. Without any pools of water for Opie to cool down, we had to continually wet him down and make him drink water to prevent overheating or dehydration. With at least 1/2 mile left to reach the top, we realized we had already gone through 2 of the 3 liters of water we brought with us (mostly drunk by Opie). The last 1/2 mile is steep and rocky, Opie looked beat, and we were low on water. We made the decision to turn around because we didn’t want to kill our dog. We did find a large flat boulder in the shade where we could let Opie rest until he recovered. Poor guy, he has really aged a lot in just the last 4 months. This hike made us realize that Opie can’t rock scramble or hike in full sun any longer. I do believe as long as the temperature stays cool, Opie can still handle some nice hikes in the future but I can’t keep choosing tough ones going forward. 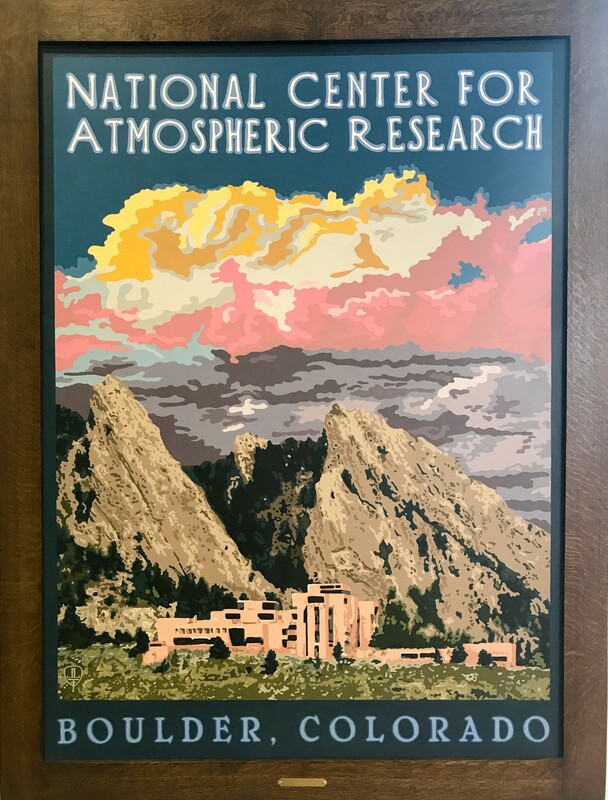 Since we were able to tire Opie out with his hike, Mike and I took a day to visit the National Center for Atmospheric Research (NCAR) in Boulder. It’s an R&D center funded by the National Science Foundation. The center provides equipment and technologies for the science community to study the Earth’s atmosphere, including meteorology, climate, pollution, sun and space weather, environmental and societal impacts on weather and climate. Visitors are welcomed free of charge and there are guided and self-guided (iPad) tours available to the public. The tours are available during the week but since we were there on Saturday, we were on our own. NCAR has so much great information on display that we didn’t need the tour. There’s information about forecasting, types of weather, and climate change. There are also some fun interactive displays and a small theater that shows various types of movies about atmosphere and severe weather. We easily spent a couple of hours perusing the displays and learning a fair bit. We even caught a small glimpse of their computer room in the basement and the type of supercomputers they use for research. It’s an impressive place and definitely worth a visit if weather and climate interests you. After Boulder, we drove to the south side of Denver to stay at one of our favorite places, Cherry Creek State Park. 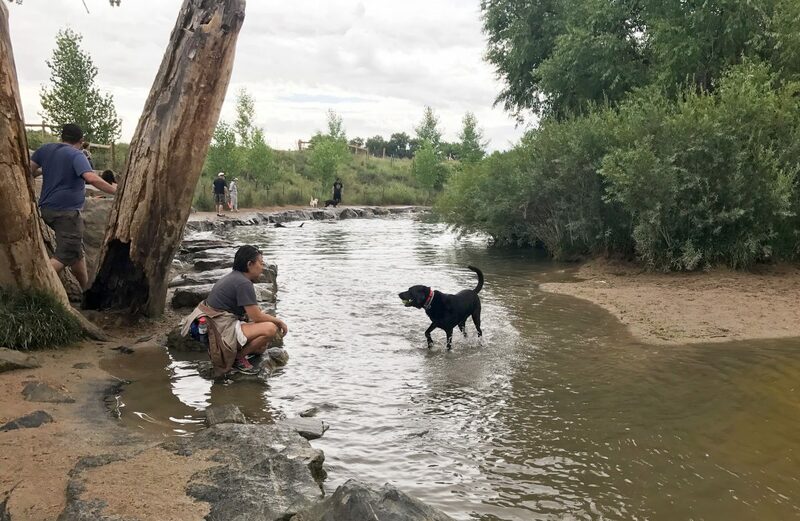 We like this campground for a number of reasons: it’s huge and has nice sites with full hookups, there are a lot of great places to walk or bike inside the park, it’s close to Denver, and it has a gigantic (100+acre) fenced dog park with Cherry Creek meandering through it. There is a $2 fee to access the dog park (or $20 yearly fee) but we think it’s quite worth it. There are nice walking trails through the entire park with the creek on one side so Opie can trot along to his heart’s content while we trail behind him at our own pace. Denver ended up being a good friend meet-up spot for us. We have a niece who lives here so she and her dog spent the day with us while we caught up on family news and tired out the pooches at the dog park. Plus we spent a fair bit of time with our Denver friend, James and sucked up a lot of his internet while visiting. He is a fantastic host and spoils Opie rotten. Last year Opie got an entire steak for dinner, and this year Opie got an entire chicken cutlet for dinner. I’m not sure Opie wanted to leave James’ home! 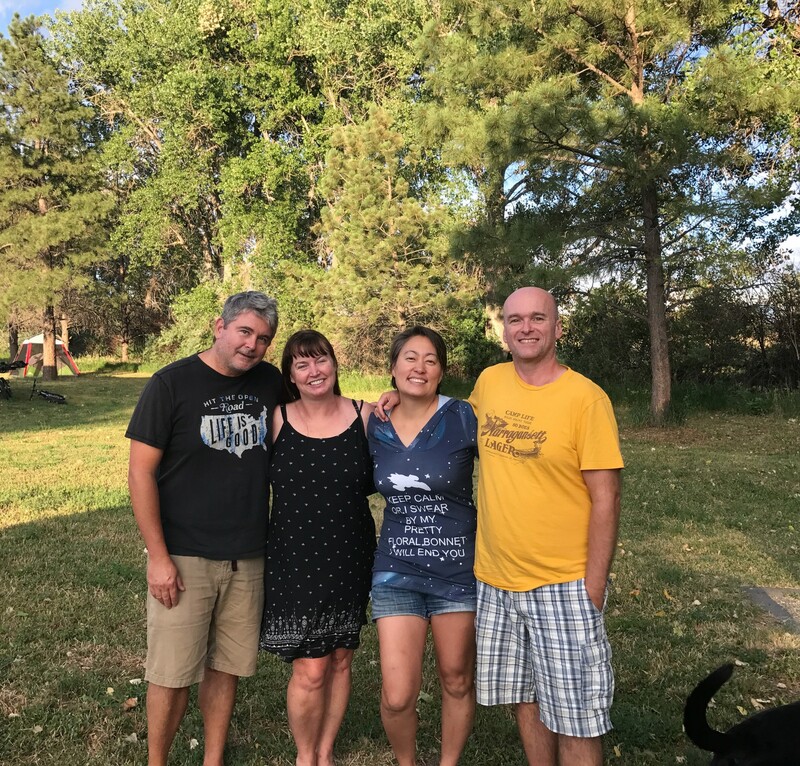 We even met with 2WanderAway, a full-time RV couple we follow on Instagram. Dave had noticed our wifi SSID and sent us a message since they follow us on Instagram also! We spent a fun afternoon chatting with Shannon, Dave, and their friend Eric. It’s always fun to meet up with other full-timers and this was no exception. We can’t wait to cross paths with them again! 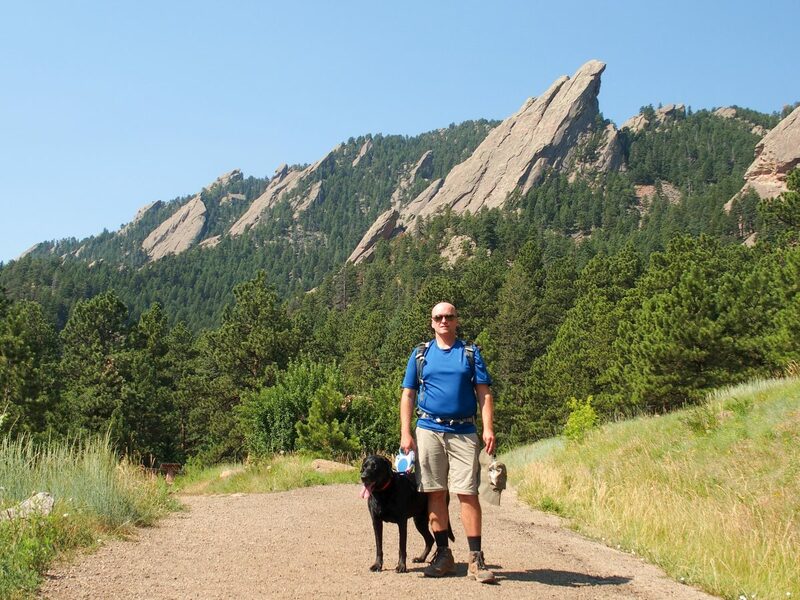 We wanted to do another hike while in Denver but there was no way we were tackling another 14er, so Dave recommended Red Rocks and Matthew Winters Park located about 30 minutes west of us. It turned out to be a perfect hike for all of us. 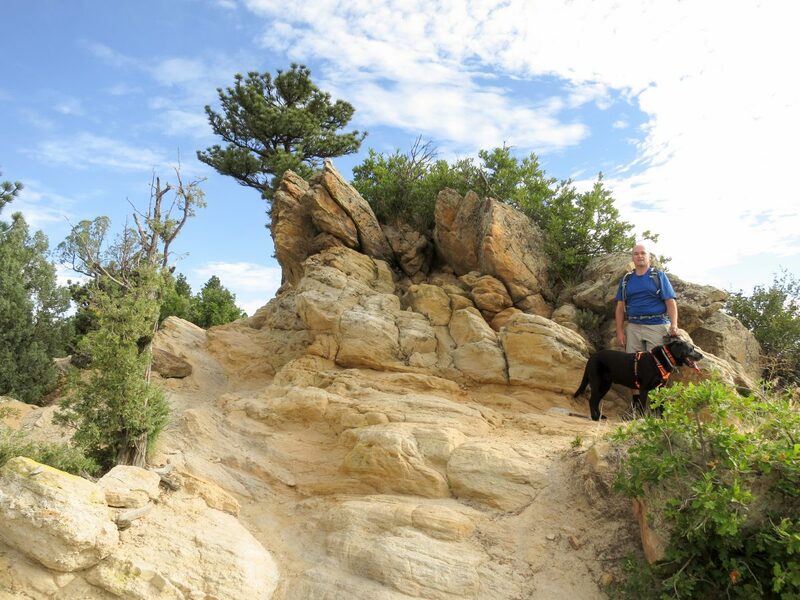 We did the Dakota Ridge/Red Rocks trail, a 6.5 mile loop with a 1300 ft elevation gain. The trail is well-maintained with no rock scrambling, and the day was cloudy so Opie actually enjoyed this hike a fair bit. 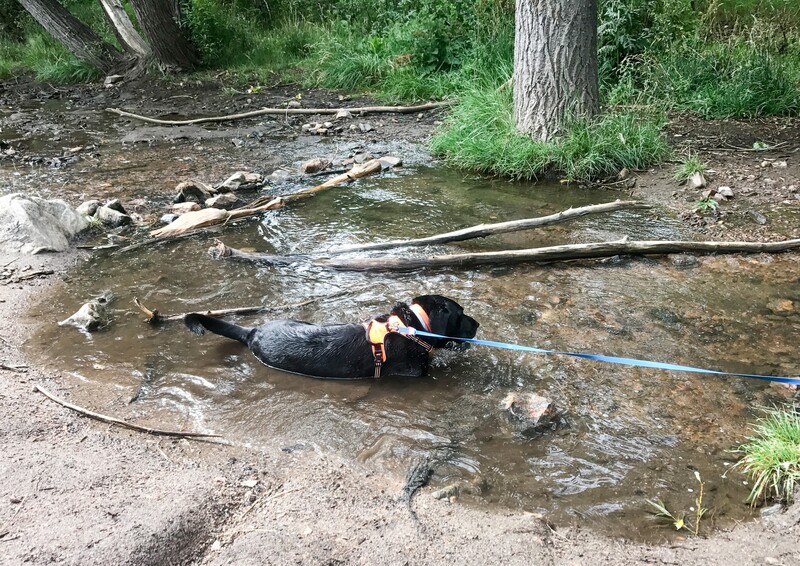 Plus a nice bonus was the small creek halfway through the hike so Opie was able to wallow in the water to cool down. 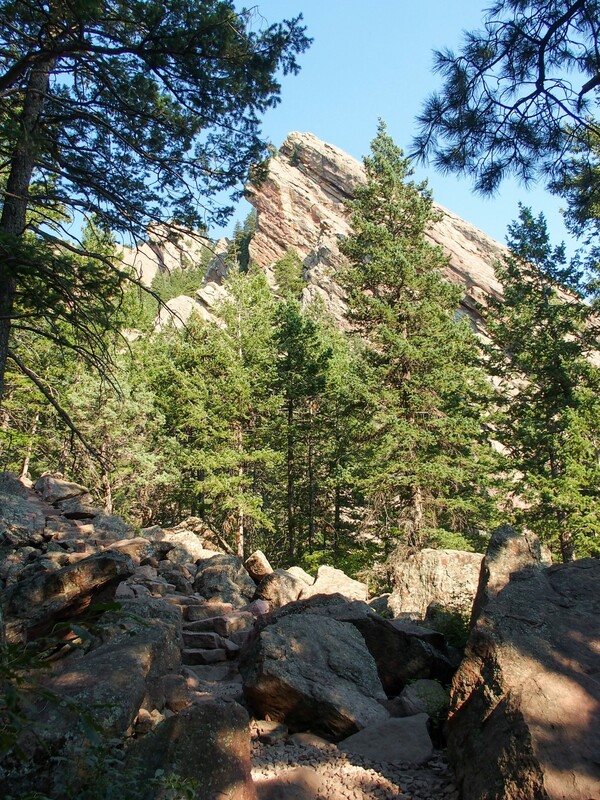 The Dakota Ridge trail walks along the top of Hogback Ridge (I have no idea why it isn’t called Hogback Ridge trail, but I digress) and provides some nice views of the Red Rocks amphitheater and surrounding areas. It’s a popular bike trail so we did have to keep a sharp lookout for oncoming bikes so we wouldn’t clothesline them with Opie’s leash. Like most of our hikes, the trail started almost empty in the morning but by 11am, there were a lot more families, bikes, and trail runners out and about. I much prefer empty trails and cooler weather so getting up early is really worth the extra privacy and quiet we gain. Opie found this creek-crossing halfway along the hike quite rejuvenating!